Our uPVC Doors are manufactured at our factory in Leeds and are extremely low maintenance. Made from 70mm, grade ‘A’ virgin polymer, our uPVC Doors and Frames also include a 28mm uPVC Panel. This uPVC Panel is stabilised to further protect against discolouration. The glass units shown within your chosen door guarantee to keep your home both warm and safe. They are double glazed to offer excellent thermal efficiency and are toughened for added security. Our uPVC Front Doors come complete with a 6-point locking system and a lever/ lever handle configuration, which is available in Black, White, Gold and Chrome. We also provide all our uPVC Doors with 3 keys as standard (please see ‘Key Return Policy’ tab). As well as White, our uPVC Doors are also available in Oak and Rosewood. Please Note: Other uPVC Door colours are available, please call our team on 0800 955 0898 to find out more. Alternatively, our secure Composite Doors are available in 11 stylish colours and any RAL colour. 1) With a Lever / Pad handle you can get locked out of your house if you do not take your key when you step outside. 2) With a Lever / Pad handle you still need to push the handle up and turn the lock with your key for your door to be fully secure. If you only pull the door closed then it is only locked on the center keep. Spyholes are available in white, chrome, gold and black. Please note: If you would like to have your spyhole at a certain height, please inform our surveyor at time of order, and ensure the order form states either the height you wish it to be at or that the spyhole to be sent loose for the installer to fit at time of installation. Spyholes in knockers are available in white, chrome, gold and black. We have teamed up with 'Lostakey' to provide our customers with a free key return service. To take advantage of this excellent free service, just revisit our website to register your installation (click here for information) and while doing so, include your unique key ring number in the space provided. We will take care of the rest. All our door styles and products are fully compliant with all UK and European standards and legislation. In the rare instance your door requires any certification; we will do this for you automatically, free of charge. It is so good to deal with a company that delivers customer service. Cannot fault it, from the first telephone enquiry to the finished installation. I would certainly recommend to friends and family. Excellent service, first class goods and the door were well fitted. I will return to Value Doors in the future. The fitter is a credit to Value Doors. I called up to ask a few questions about the products. I spoke to a pleasant man who was very polite, approachable, friendly and helpful. So I arranged someone to come round to fit me a new back door. Fantastic, knowledgeable, experienced door fitter. I couldn't fault any part of my experience of buying from Value Doors. Simple to follow website, helpful on the phone, prompt delivery and installation of a great product at a great price. Great product, fitting and service. Really happy with the door and Matt has installed it beautifully. Very happy with the product, price and work carried out. A smooth and pleasant transaction from start to finish. Thanks. Everything went well as planned. The installer arrived on time, explained what he was going to do. After fitting each door he cleaned up after himself. Glenn was very polite and just got on with the job. Glenn was an excellent fitter, the product is of a good quality and I would recommend Glenn and Value Doors and the windows. Paul - Arrived on time, friendly, seemed very knowledgeable and conscientious. Andy Denton was my installer. He was prompt and very responsive to my needs. Advised me accordingly and very clear about the process and pricing. Ongoing communication until installed, and installation without any issues. I am very happy and will use you again and recommend you as necessary. Thank you for your help on this. Compliments to your staff keeping me informed. Friendly fitting team more than helpful. I will recommend you. Thank you, John. Cash and Arj are excellent fitters. They are very courteous and made the minimum disruption. Everything was cleaned up after the job. I am very pleased with my new door. If I need anything else I will use Value Doors. Thank you. I am more than happy with the whole product and service supplied by Value Doors. The two men who came to measure and then fit were polite and friendly and happy to take the time to explain everything. They arrived on time and took every care to fit the frame and door to a high standard and were both working hard for about 4 hours. The attention to detail was excellent and they explained that, due to the damp location, they had triple sealed the door sill and gave me advice about keeping the door in good order. They left my home tidy and removed all traces of dust and debris and I felt so happy and relieved as I looked at my beautiful new door in place of the rotten one which was no more. I would thoroughly recommend this company and hope aLl the fitters are as fab as Arj and Kash. Excellent service - tel call answered promptly, quote emailed promptly, installer called and subsequently arrived on time, quick installation and lovely job all round. Very pleased. This is the second door Kash and Arj have now fitted for us, and the service was just as good as the first time - not only are they good, they are consistently good, which is excellent! Very happy with the service, would definitely recommend, and would use again if we need any new doors in the future. Thank you, very good job! Lovely fitters. Very polite, friendly and helpful. Arrived on time and left everything spotless. I would recommend to anyone. The installer Matty, was punctual, polite and highly efficient. He was friendly and worked tidily. An excellent job done. I am delighted. Thank you!! Very pleased with the service, very polite and friendly, quick and efficient, couldn't be happier! Thank you! The fitter was friendly, polite and did a good job. Very good experience. The guys that came were very helpful and friendly - they pointed out various options and decisions. I felt informed. I would be happy to recommend other people to Value Doors. Very happy, fitter very pleasant & cleaned up as he went along, highly recommend. Very happy with the service and the installation. We were pleased that the surveyor who measured for the new door also fitted it. He was punctual and polite and he obviously knew his job and was very particular about cleaning up and ensuring, we the customers were happy with his work. Overall, I am happy with everything. We recently had Value Doors, to supply and fit a new front door. We were so pleased with the service from start to finish, so have just had a new kitchen door from them. As before, the service and workmanship was faultless, and we cannot praise Simon, who fitted it, enough! We will definitely use Value Doors again in the future, and would have no hesitation in recommending them to anyone. Thankyou. The installer Andy was very helpful and friendly. I felt reassured as he was trustworthy. He was efficient and kept the area clean. He involved me in the work and made sure I was happy with the overall finish. He had been to the house to start the quote process and I was impressed with the knowledge he had and the respect he showed for the house and my opinion. He is a credit to the company. The door looks amazing. It is better than I envisaged. The website helped me make a good choice. Our experience from start to finish has been excellent. The customer service we received from Simon was first class...he was so polite, friendly and professional, and nothing was too much trouble. We are so pleased with the end result that we have already decided to use Value Doors in the very near future to provide and install another door! 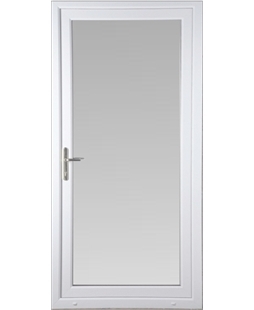 We would have no hesitation in recommending Value Doors to anyone. Thank you for a wonderful and pleasant service. As ex Management Consultant and University Lecturer, l was impressed by your website and package deal. The door looks good and the installer was efficient and courteous. Me and my Wife were extremely happy with the service and the quality of the work provided. We most certainly will use the fitter and Value Doors for any future work and will recommend to our friends and family. Dan our fitter was thoroughly professional arrived on time and has done a great job. Also whenever we called the office they were very helpful. I would recommend to anyone getting a new door fitted and will use again in the future. Many Thanks to Matt & Dan! My experience with Value Doors has been great from start to finish! The guys on the phone were very helpful and friendly when taking my order. Dan, who installed the door was excellent and I am very happy with my new back door. Excellent service and lovely door. So pleased with our new door. Easy to pick which one we wanted online. The price was clear and easily the best, but not compromising on quality. The door was fitted two weeks after we ordered, workers were friendly and clean and worked efficiently and quickly. Couldn't be happier. Very happy once again with the service, will definitely use again. Excellent service once again from the company and installer Dan, I will be having further work done in the future. Andy was great - I would have no hesitation getting him to do further work on the premises if I ever need it. Would also recommend him to others. Martin Hindley (who we dealt with from start to finish) was a lovely guy with a great work ethic, very professional and he did a wonderful job. We'd have him back without a doubt should we need any further work doing. The door has only just been fitted but looks great and the fitter was excellent. Clearly, we will need to see if it drops or if there are any gaps but initial thoughts are a great job well done! Greg was a true professional from start to finish. He was very helpful and put me at ease straight away. On the day of the installation I couldn't take time off work so my dad stayed at mine. My dad also commented on Greg's friendly and professional manner. The door is perfect, Greg made good any damage sustained to the outside wall which bearing in mind it is a pebble dashed wall is brilliant. I would highly recommend the company to other people - very happy it has transformed the whole of my kitchen. It was great; smooth as can be. Fitter helpful, friendly, knowledgeable. I am really impressed with the doors, they look great, Robin Biddle was very polite and friendly, he did a good job and cleaned up afterwards. I also like the fact that the old doors were taken away afterwards. Great service. Paul Sloan did a lovely job. Great work! Neil was superb, the installation was not straight forward as with many old houses there were surprises with each layer he removed, but kept me informed and with all the problems and how he would make things work properly so it would last. Neil was courtious on time and great with letting me know what was going on. A big recommendation for any one in South London looking to get some doors put in. Great service offered from the beginning to the end. Starting with head office who were very patient to explain everything to the detail through our purchase, down to the installer who carried out an outstanding installation, leaving us astonished with the result. Thank you for everything. We are very pleased with the product. delighted with the installation. Dan was very courteous got on with the work and made a really nice job of it. The whole process was a good experience. Alan was great, worked really hard to get job done. It looks fantastic and really happy with the product. So refreshing to see a company have a website with the correct pricing without any hidden extras. You said it would cost exactly what it did. We're really happy and I would recommend you without hesitation. Thanks. Very happy overall with everything. Fitters were friendly and tidy. I was very pleased with Neil's work and the speed with which it was completed. He got down to business as soon as he got here and worked on until the job was done, including a particularly nasty rainstorm without a break. His attention to detail was admirable and I would be happy to recommend his work to anyone. The work was carried out to a very high standard by a very professional, informative and friendly fitter. At the end of the installation, we booked to have the front door and side panel done too. The fitter initially weighed up the job in full detail with sensible suggestions, arrived as planned to carry out the work, everything fitted correctly, the work was carried out conscientiously and we are pleased with the result. Installers were very efficient and friendly, completing job to a very high standard. Very pleased with the result and our new front door looks excellent. Will definitely use again next year when we plan to replace some of our windows. More than happy with my front door and that's why I came back to you for other door. Very pleased with service and product. Nice, tidy work. Very pleased, happy to do business with you again. Very happy with the product, service and installation. Absolutely delighted with the window and craftmanship. Very impressed that it was finished in a day too. Thanks very much. I have recommended Value Doors to two friends needing replacement windows already! Couldn't have dealt with a better company. From start to finish the installers were friendly, David kept me informed all the way through, I would definitely use these guys again and will be recommending to anyone and everyone. Liked the no pressure quote by Glenn and good price. The service I received was excellent, good quality door. Installation by Glenn was first class. I will recommend to others. Many thanks. Ross did an exceptional job, which was hardly surprising given the standard of work he has done previously. Can't recommend higher. Paul was very polite, capable and a good workman. Very conscientous hardworking fitter. A good job done. Would not hesitate to recommend to others. Excellent service from start to finish. Robin did an excellent job and the product is great quality. Friendly and efficient service, no pressure sales. Arrived promptly and fitted quality qindows, would definitely recommend and use again. Very polite installer, friendly, really pleased with him. Job well done, nice people. Fitter had arrived on time and was left to it and did not stop til the job was complete. Did not rush and done a fine job. Cannot fault the work or quality of the door and window at all. Excellent service and installation, many thanks. A very polite and helpful man. Very professional and went beyond the service. Very happy to have met him; a first class job. Matt was polite, efficient, quick and worked to a high standard. I am very pleased with the service, also in the future if l need more work doing l will not hesitate to contact you. A first class installation carried out with efficiency in a warm and friendly manner.